The challenge this year, was to use Ranger's Perfect Pearls with Sticky Back Canvas from Claudine Hellmuth's Studio Line. I had no idea what to make at first. The new Pearl colors are so pretty-the new colors are Grape Fizz, Blue Raspberry, Sour Apple and Pink Gumball. The sparkle reminded me of butterfly wings and that's when I knew what to create. The background was made using a few different colors of Studio paint-Pink, Orange, Yellow and Red. After blending the colors and getting the shades just right, I added the Grape Fizz and Gold Pearl powders in different areas. I covered wire hangers with sticky canvas that were painted brown and dusted with gold to create the branches. I also colored some canvas with Lettuce Adirondack paint, stamped with the Perfect Medium and dusted them with Gold too. Then I cut out some leaves from it. The flowers are, Prima Craftables. I added Studio paint in the flower center, sprayed them with Iridescent Pearl Spray and added a pearl. When I sprayed over the paint in the center of the flowers-the paint bubbled up a bit-the effect was so cool! I am definitely trying that again on another project soon. I cut the butterfly out by hand. I sketched it on the canvas first. 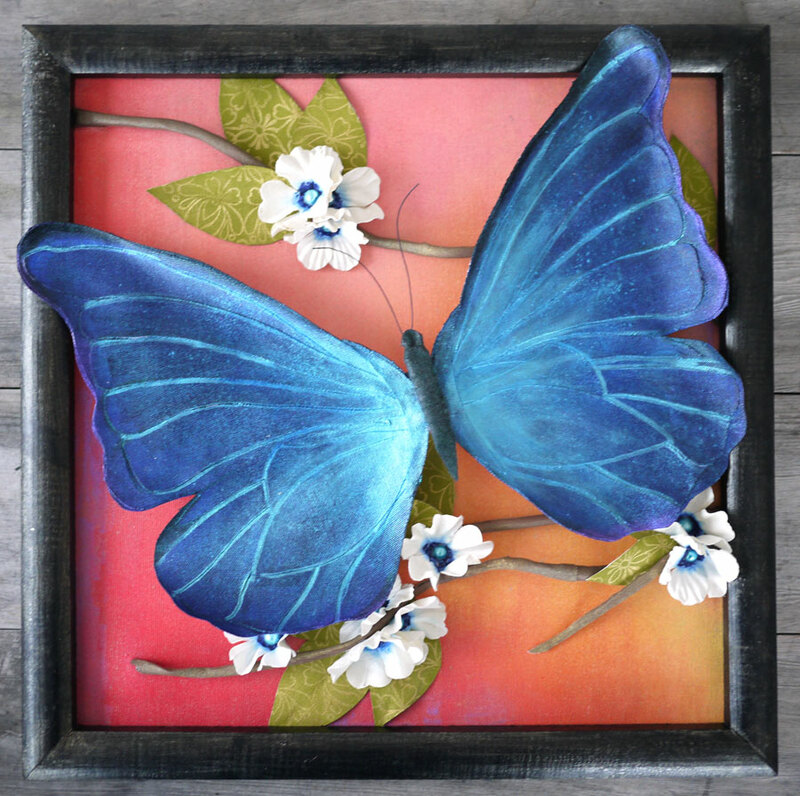 The base of the butterfly is one large piece. It came out a lot larger than I had originally anticipated. Haha! Then I cut out several smaller pieces to layer over the wings. I painted it with Studio paint-Smidge of Blue, then added black around the wing edges. I mixed Blue Raspberry and Grape Fizz pearls-then blended them over the wings. I used the Perfect Pearls pen to outline the smaller shapes on the wings for a defined look. I think this project looks way better in person. I was really happy with the outcome-it exceeded my expectations. And I was so nervous knowing it would be displayed in the Ranger booth, with all of the amazing pieces everyone submitted. No pressure-ha! Things have been crazy since my return from Los Angeles and I apologize for once again leaving my blog unloved. Even after being gone for a week of work, I had more work to get done when I returned. I had so much fun and it was great to see everyone from Prima. Tami opened up her home to four of us and she was an amazing hostess! She put up with our craziness and late night laughs. I got to see so many old friends and new ones too-thats my favorite part about CHA. It's nice to connect with everyone in person, give them a hug and catch up a little. And a big thanks to Pom for taking such good care of us while were there-love her! I arrived a day early to help with preparations for CHA. I had no idea I would be altering a life sized dressform. This is by far the largest project I have ever taken on and I surprised myself with the results. I named her Lucy. 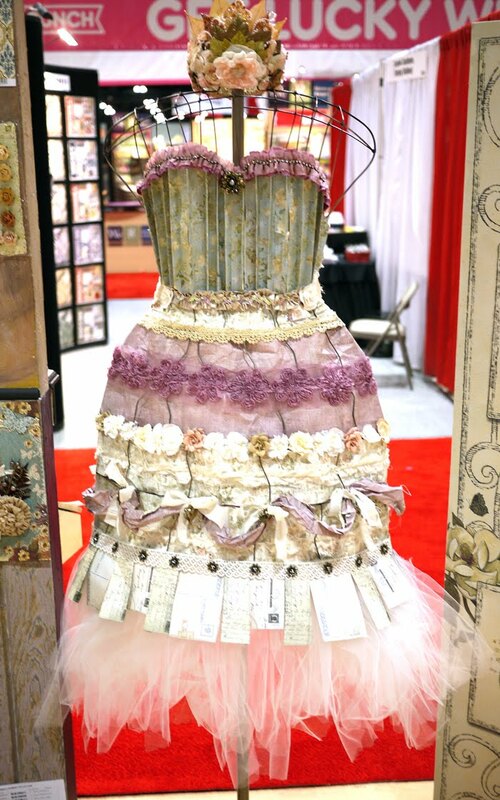 She is adorned with gorgeous Prima papers (Botanical Collection), flowers, trim and metal trinkets. Sandi brought in her sewing machine (thanks Sandi! ), some muslin and embroidery floss--then I got to work. We had one day to get our dressforms made and ready for the booth. I cut long strips of patterned papers, sewed them together end to end, and added a strip of gathered muslin down the centers. Then I weaved the long paper strips through the metal. I put Pom to work and had her cut out the postcard images from the papers, attached them to lace ribbon and made that the bottom of her skirt. Some metal flower trinkets were added along the lace strip too. 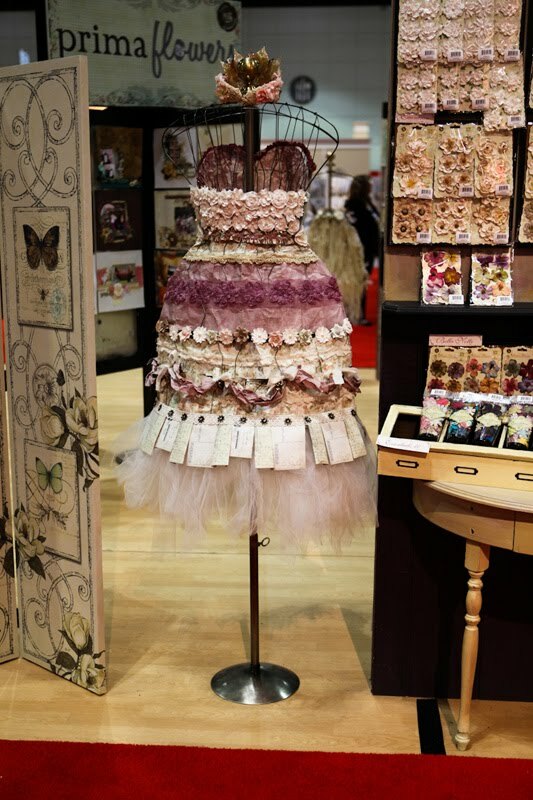 I tied long pieces of tulle under the postcard skirt and fluffed them out to give the skirt a little softness. I took skinny long pieces of patterned paper and sewed them end to end. I crumpled them to make them look like fabric swags and attached them to the metal with strips of muslin. Between each paper weave, I added rows of flowers, trim and lace to give the skirt a finished look. 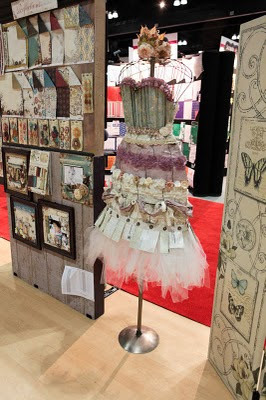 The bust was made with strips of paper, with pleats added to look like a corset, topped with gorgeous Prima trim that has rhinestones running along the center-it finished it off perfectly! And the back of the bust was completely covered with Innoscence flowers-all white and different styles mixed in. You can see them in the packaging on the top right corner displayed in the booth. I was so happy with the results and she was a star in the booth! Would I do it again? In a heart beat! It was so much fun! There were three other dressforms in the booth that were just as stunning and all so different...I will post them once I get some photos together. Thanks for stopping by-hopefully i will get a moment to update again soon.